Fresh and full of flavor, this glass noodles pork stir fry will become your favorite quick lunch noodle bowl. 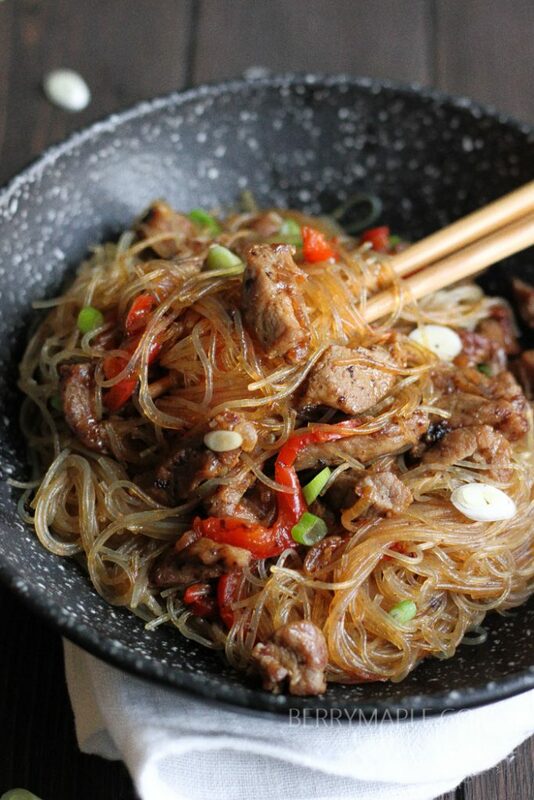 Clear, cellophane noodles- whatever you call them, are delicious and widely popular in Thai and Chinese cuisine. Everybody have something in their pantry they can’t live without and sometimes it takes more place then should? In my house is clear(glass) noodles. It’s so easy to make any noodle bowls with them ! Just let them soak in a hot water for 5 minutes, garnish with veggies or cooked meat and it’s ready to eat! Variations are endless. 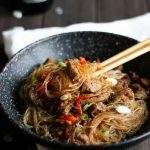 What are glass noodles made of? This noodles are made of a starch ( most popular are bean starch , yum or potato starch). I personally enjoy made with bean starch most. 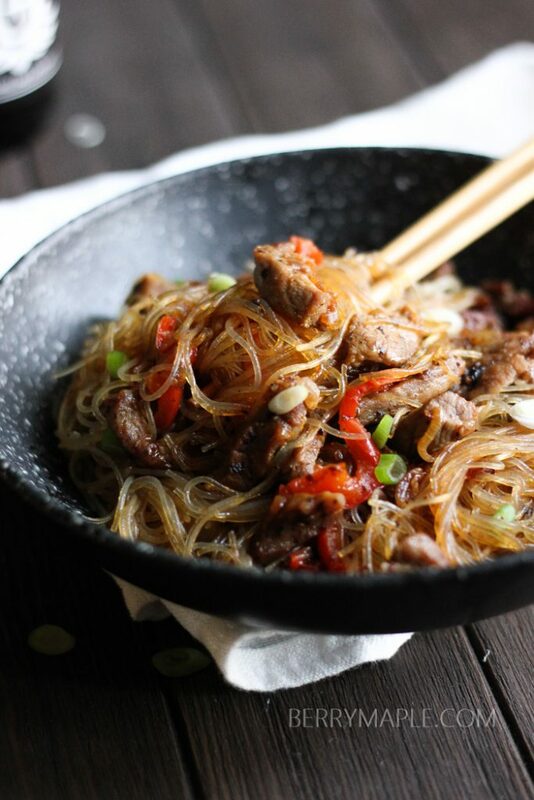 We would just mix glass noodles with fried beef strips, hot sauce and soy sauce. It makes an appetizer or a fantastic main dish! How do you cook clear noodles? Most common version of stir fry is with vegetables and some kind of protein. You never know how much your toddler can eat until you give them clear noodle bowl. My kids were licking their plates asking for more ! Win! Fresh and full of flavor, this clear noodles pork stir fry will become your favorite quick lunch noodle bowl. Heat sesame oil in a pan. Slice onion and bell pepper very thin and cook over medium high heat for about 5 minutes, stirring, until very fragrant. Add sliced pork, soy sauce and hoisin sauce. Cook on medium for 15-20 minutes, stirring occasionally. I made this for dinner and it was a hit with the whole family. The hoisin added a lovely sweetness that the kids loved. This is the exact recipe I’ve been looking for! I have never made anything with clear noodles before, but I have the meanest of cravings!